George N. Pierce (1846-1911) formed a company in 1873 with two partners known as Heinz, Pierce and Munshauer for the manufacture of refrigerators, bird cages, ice boxes and bathtubs. Pierce left that firm in 1878 to establish a rival concern under the name of George N. Pierce & Company, and in 1888 added a line of children's tricycles, a product that was becoming very popular at the time. By 1890, Pierce started building a full line of adult hard-tired and cushion-tired "safety" bicycles. By 1892 Pierce had dropped all of his other products except birdcages and iceboxes and in 1895 he stopped manufacturing these, too. He then continued as just a bicycle company. 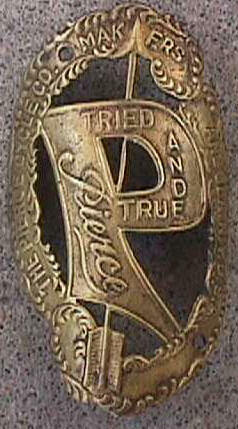 The earliest Pierce bicycles' nameplates used an arrow which was to become the familiar hallmark of all of Pierce's advertising and nameplates for decades to come. Pierce made what was probably the best bicycle of this era. 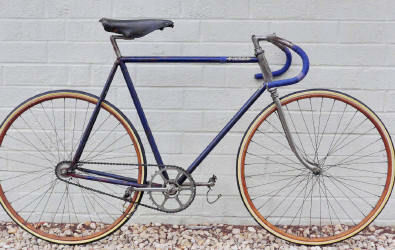 It had a shaft drive, which was considered preferable to the chain at this time. State-of-the-art suspension came from a front fork of spring leaves and a telescopic shock absorber on the drop bar. It was called the Pierce hygienic Cushion Frame with an eye toward its healthful anti-vibration qualities. The company's 1897 model sold for $75. In 1891 Pierce also began producing automobiles which culminated in official launching of the Pierce-Arrow Motor Car Co. in 1907.
the Crystal Palace Velodrome in Salt Lake City.